Sony's Vaio BZ series is aimed predominantly at business users. Will professionals be convinced by the relatively affordable Vaio VGN-BZ26M, with its magnesium bodywork, dual-core processor, matt screen and DVD burner? And is it also suitable for the home office and a game or two? We put the machine through its paces. 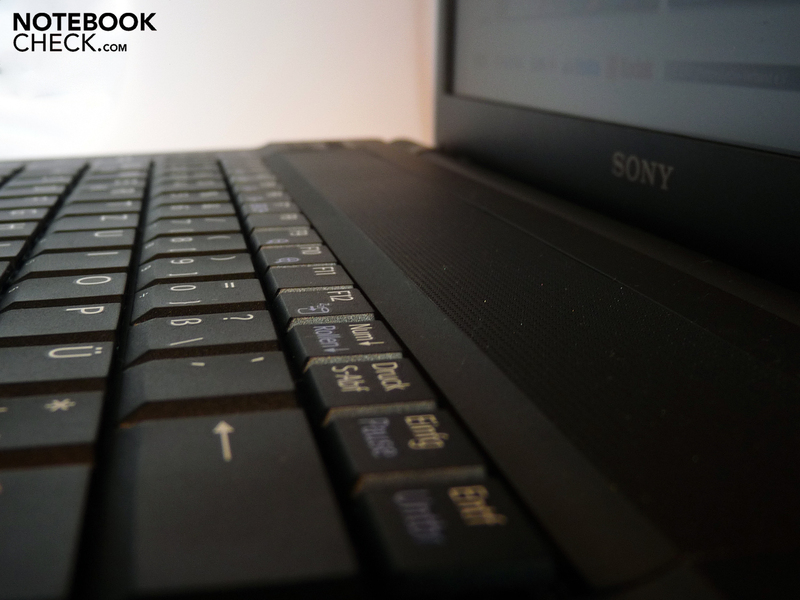 The notebook is essentially a Sony Vaio BZ21 or BZ13, but with some features stripped out, such as the fingerprint scanner and webcam. 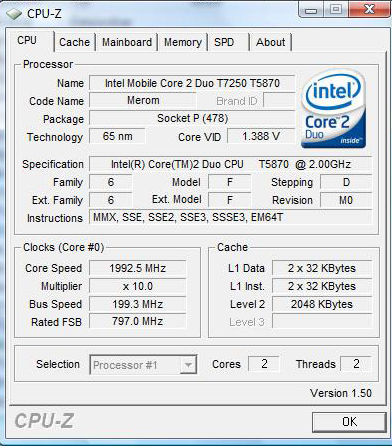 It also has less RAM and a slower processor (2GB DDR2 RAM and a 2GHz Intel Core 2 Duo T7250). This brings the base model down to a mere 700 Euros, not a bad price for a magnesium chassis, matt screen and smart design. Here we see one of Sony's recent design features, where the keyboard area is on a slightly lower level than the rest of the base unit. The cylindrical mechanism connecting the lid to the back of the base unit is prominent; as well as the hinges it also houses the power button on the far right and the power socket on the far left. 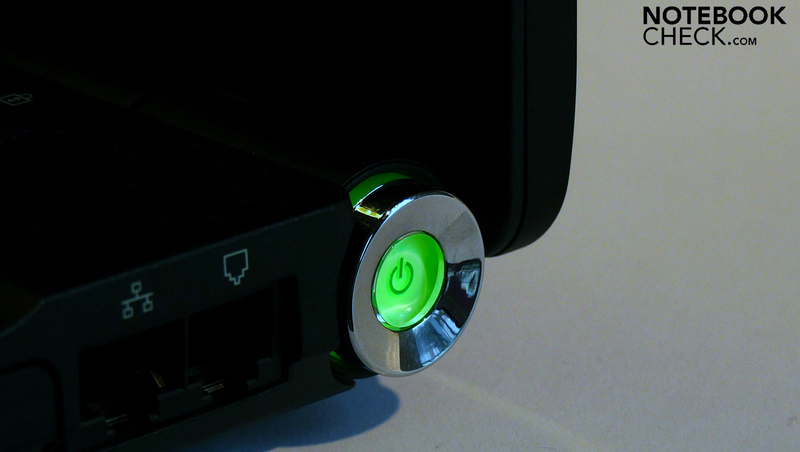 When the laptop is in use the power button glows a smart green, and red when idle; it blinks to warn the user when the battery is running out. 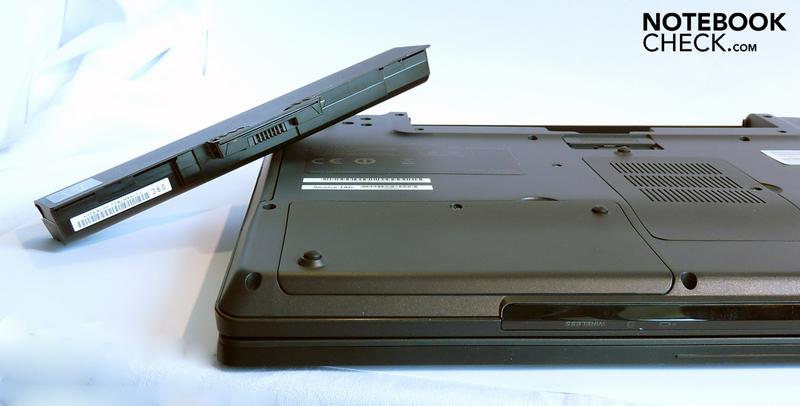 The laptop's surfaces are pleasant to the touch, with a powder coating. This stops it from accumulating fingerprints, and according to Sony is also environmentally friendly. The lid, the display bezel, the keyboard edging and the palm rest area are allmatt surfaces with a good feel to them. 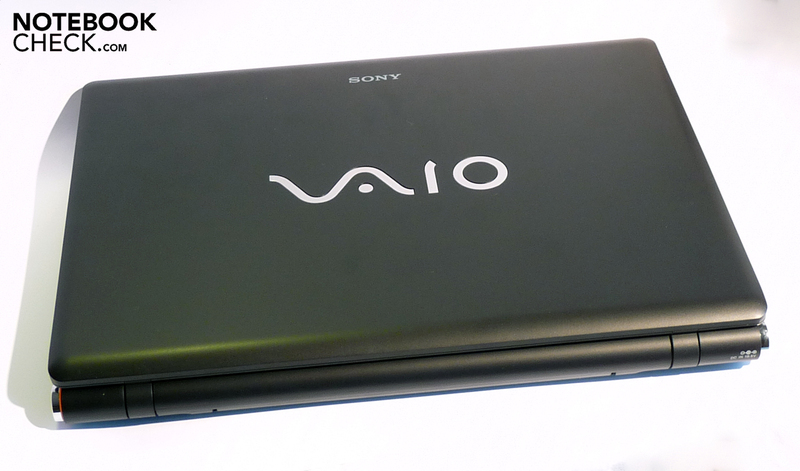 The Vaio logo appears on the lid, detailed in shiny chrome, as well as on the base unit where a smaller version is imprinted into the casing. The magnesium chassis is robust and of high quality. While the lid is plastic, it also looks to be of good quality, and is so robust that you have to use brute force on the back of the lid to cause any screen distortions. However the lid does twist a little under moderate pressure, causing dark patches to appear on the screen. Apart from this the case is very much of superior quality. It does not creak or bend; the only thing is that the keyboard gives way a little over the DVD drive. The lid's two slender hinges cannot quite prevent it from wobbling slightly when you adjust the angle. However they are strong enough to hold the screen reliably in all positions, and when the laptop is closed there is no need for any additional mechanism like hooks or magnets to pull the lid towards the case; the lid lies flat and is held in place by the strength of the hinges. This resistance does stop you opening the lid of the laptop with one hand. The case lifts up from the desk if you try, and you have to hold it down with the other hand in order to open it properly. Even if you are just adjusting the viewing angle you will need to have a second hand free. The lid does not go back further than 45 degrees beyond the vertical, since the hinges are attached to the front of the lid rather than the underside, so that part of the lid sticks out beneath the hinges and hits against the back of the notebook. But it is very seldom that you need to tilt the screen any further back than this. Sony leaves the immediate area around the screen free of any LEDs or glowing buttons, which could potentially cause glare in your field of vision. 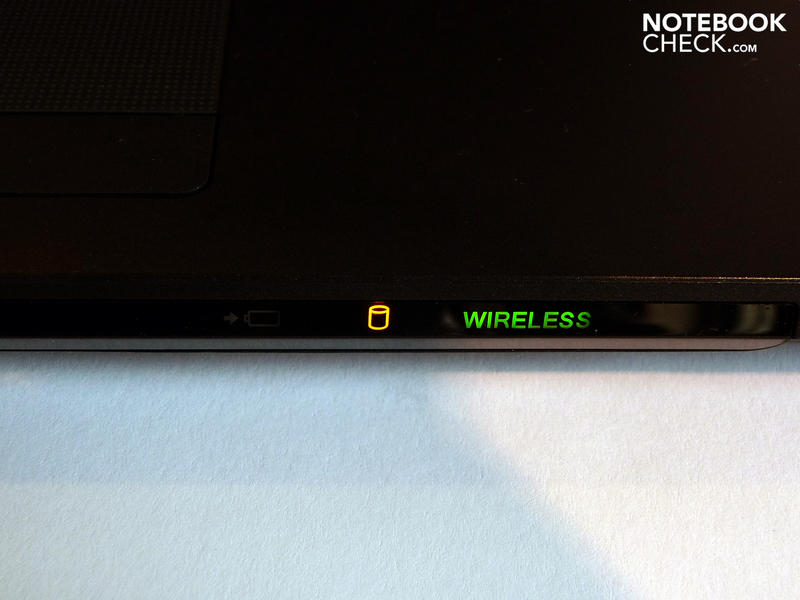 The only status lights are on the very front of the laptop and indicate battery charge, hard drive activity and WLAN status. Wireless can be switched on and off via a software tool as well as the actual switch which is positioned above the keyboard. This is practical, as it means you don't have to fumble around looking for it on the sides of the machine. 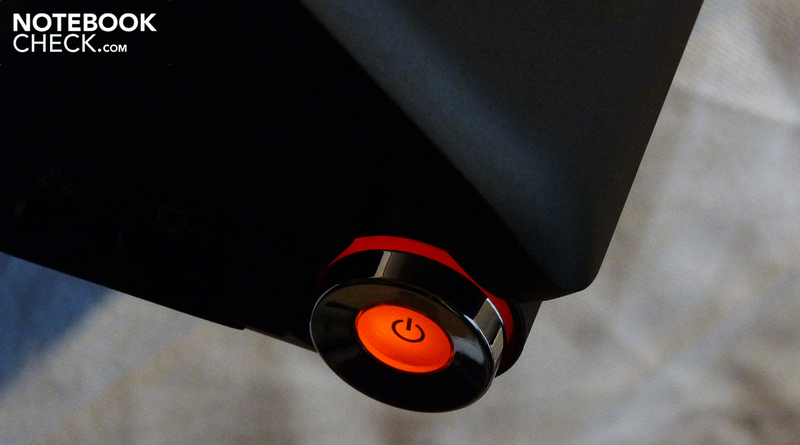 Below it is a switch for muting the loudspeakers, as well as a presentation button which activates VGA output, which automatically start a video projector for example. The front edge of the notebook houses the headphone and microphone jacks on the far left, both taking a conventional 3.5mm plug. Further to the right is the Memory Stick/ Memory Stick Pro reader, followed by a separate SD card reader. 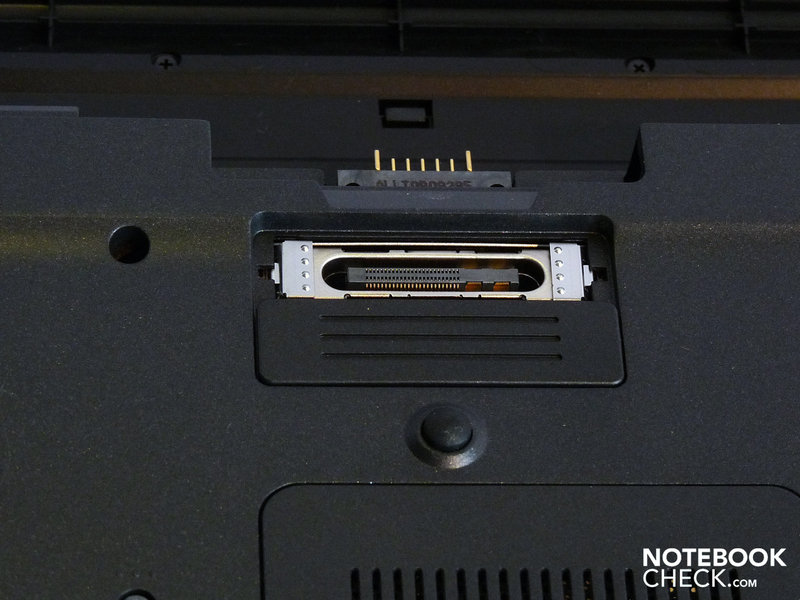 Along the laptop's left-hand side there is a PCMCIA slot which supports expansion modules such as TV cards or cards with additional USB ports. This is followed by a USB 2.0 port, VGA connector, air vent and Kensington lock slot, as well as the power socket at the back. On the right-hand side a Firewire port is positioned right at the front, followed by two further USB 2.0 ports, the DVD drive, a LAN port and a modem port. As already mentioned, the power switch can be found on this side right at the back. 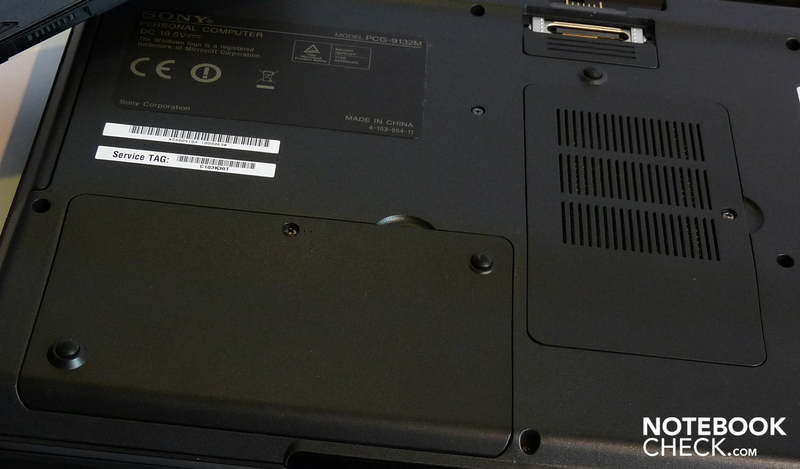 The back edge is clear of ports, but on the underside of the machine there is a docking station port, as is standard for business laptops, along with access panels for the memory and hard drive. The battery is also inserted from underneath, and not the back of the notebook; it can be changed without having to close the lid. Both right- and left-handers should get on fine with this layout; since there is at least one USB port on each side, you can plug in the mouse wherever suits you best so that the plug and cable don't get in your way. Left-handed people will have to live with the air flow coming from the fan, but the air does not get hot very often and the vent is placed quite far back, so it shouldn't present a real problem. Left: PCMCIA, USB 2.0, VGA, air vent, power socket. Right: Firewire, 2x USB 2.0, DVD drive, LAN, modem and power button. Sony has pre-installed a 32-Bit version of Windows Vista Business. Also included is a downgrade to Windows XP Professional SP2, in case Vista is not your cup of tea. 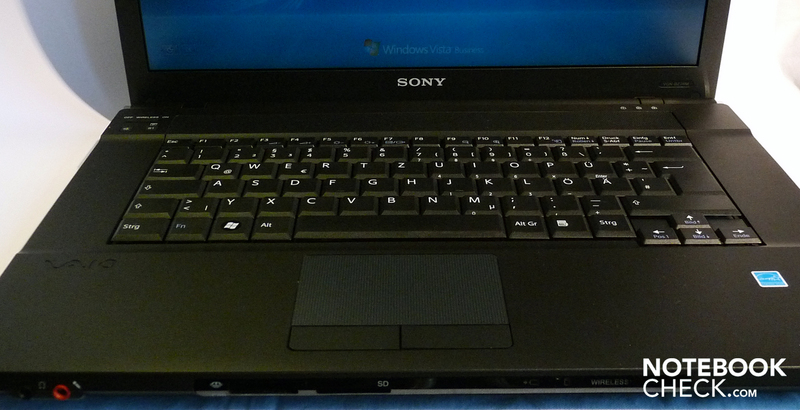 As of 26th July this year Sony also offers an upgrade to Windows 7 for all notebooks with Vista Business. So in effect you get a choice of three operating systems, at least before the release of Windows 7. However there is no recovery CD with Vista, only a hidden partition on the hard drive, from which you can create your own recovery disk. Sony includes the almost obligatory trial version of Microsoft Office as well as McAfee internet security suite, which you can update free for 60 days. 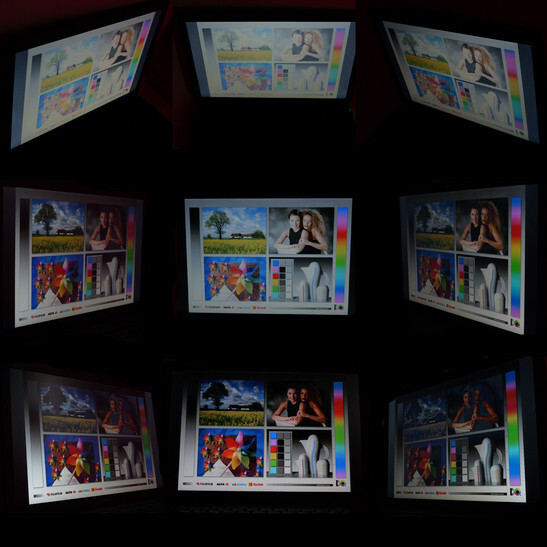 There is also the DVD player software Win DVD, burning software Roxio Easy Media Creater and various Sony programs for video and photo editing, amongst other things. 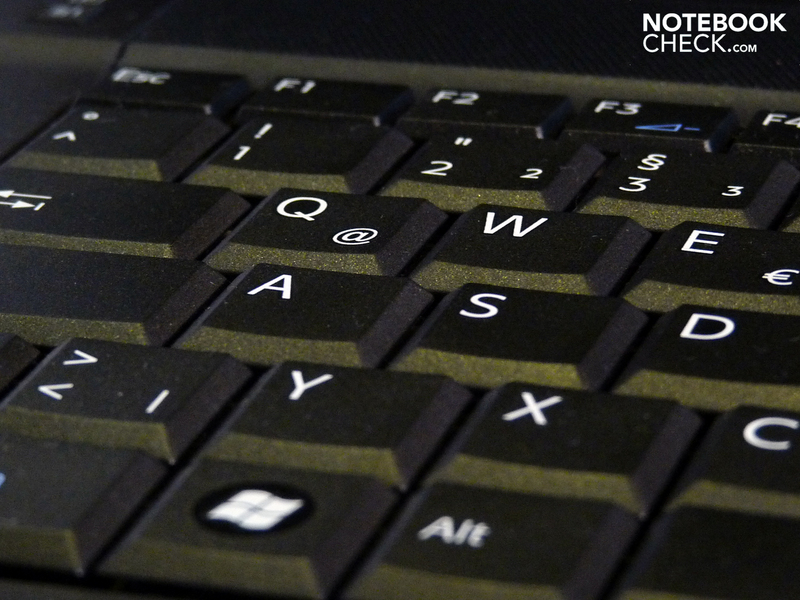 Unlike almost all consumer notebooks by Sony, the BZ26M does not have a chiclet keyboard, with keys that have relatively large spaces between them. Instead it has a conventional keyboard. This offers a pleasantly firm typing sensation with good sized keys, but it leaves no room for a separate number pad. This omission could also be put down to the 16:10 format of the laptop, since it makes the machine somewhat deeper and not as long as the 16:9 machines which have become so widespread in the consumer market. The keyboard dips a little under pressure in the area over the DVD drive. This is one of the very few flaws in the workmanship of the machine. However, this flexing is within acceptable bounds. Other than this there are no problems typing. The keys do not make too much noise, and there are no unpleasant surprises in the keyboard layout - everything is where you would expect it to be. The touchpad is distinguished visually and physically by means of its dimpled surface, as well as being slightly recessed from the surrounding hand rest area. It is not too easy and not too hard for your finger to glide over the lightly textured surface; exactly as a touchpad should be. The only difficulty we had was with the scroll function, which is automatically activated when you touch the far right of the touchpad. The problem is that there is no readily identifiable border between the scroll area and the rest of the touchpad, so that it is easy to slip out of the scroll function and suddenly find yourself moving the cursor instead of the contents of the screen. The two touchpad buttons are somewhat loud when you use them, but other than that there is nothing to complain about. They give good tactile feedback and are clearly differentiated from each other. For those spending a lot of time working on their notebook, a screen with a matt finish is far more ergonomic than a glossy one, which produces distracting reflections which are tiring on the eyes. The BZ26M naturally has a matt display, as it is aimed at the business consumer who will be working extensively with their machine. The screen has a resolution of 1280 x 800 pixels and a 16:10 aspect ratio. This does mean that you will get black strips above and below the picture when watching widescreen films, but for office use it is a definite advantage to have the taller screen, as you will need to scroll down less when reading documents. The colours on matt displays are often not as brilliant as on glossy ones, and this is true of the BZ26M. Also the brightness is adequate at best, with an average of 165cd/m². But this should not present a great problem, unless your desk is right under a window or you are sitting on a park bench outside in the bright sunshine. On the other hand the uniformity of brightness is very good at 83%, with no visible irregularities. The contrast and black value could be higher, but are perfectly okay for office use. The picture appears distorted pretty quickly when you view the screen from the side. The colours also deteriorate rapidly when you tilt the display back and forth vertically. This is an area for improvement. Admittedly it could be seen as an advantage that not everyone can see what is on your screen, as perhaps you will be reading sensitive documents. However, Sony does offer a special screen filter for such purposes. Overall the screen is suitable for use in the workplace, but it is not an exceptional effort by any means. The monitor's vertical viewing angles are a little weak. 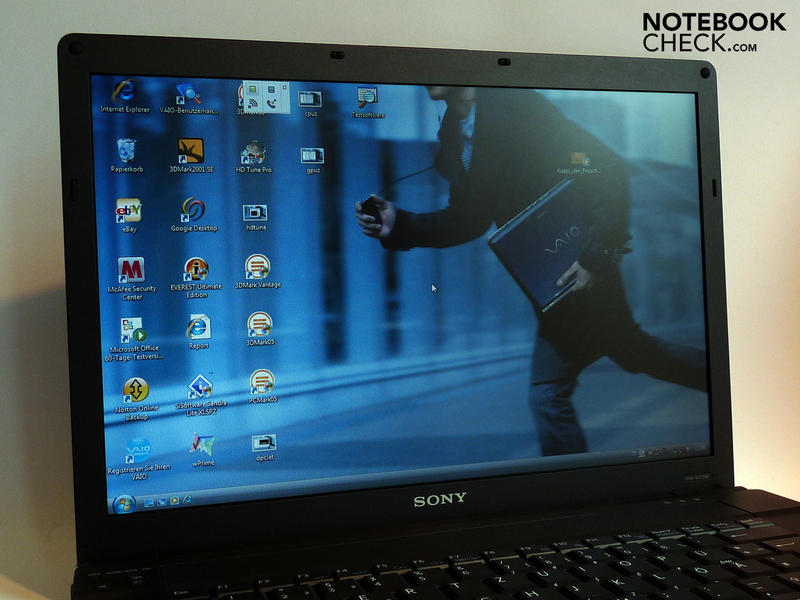 Sony has equipped the BZ26M with an Intel Core 2 Duo T7250 with 2.0 GHz clock speed, to handle all office uses. The processor uses a relatively large amount of energy with a thermal design power of 35 Watts, but does give better performance than low voltage CPUs, which are used in many of the slimline notebooks. The results of the PCMark05 test and other benchmarks lie in the expected range: 4123 points is a good average score for the processor. The second core in particular makes almost every process faster. The Cinebench R10 test (multi-CPU rendering) shows that the increase in speed is almost double; with several processes being carried out simultaneously the speed gain can be even greater. 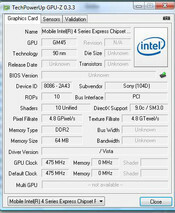 Sony has chosen the Intel GMA 4500 MHD graphics card, integrated into the chipset and using up to 700MB of the memory. This graphics card is more than sufficient for office tasks, but you will only get good gaming performance with really old games, despite the fairly low native resolution of the screen. The 3DMark tests confirm this: while it achieves a score of 3684 in the 3DMark2001 test, this falls to 1052 points in the 3DMark05 test, and the benchmark sequences seemed more like slide shows than fluid gaming scenes. 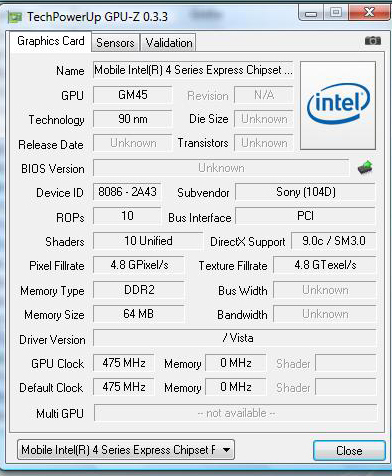 Our test model has only 2GB of 800 MHz RAM. However, there is a spare slot so that a second memory module can be put in. Of course only 3GB would be sensible with a 32-Bit operating system; any more and a 64-Bit system becomes necessary. The hard drive is a Toshiba MK2555GSX, with 250GB of space and 5,400 rpm. If you download a lot from the internet, or have a large collection of photos or music, you might find that the hard drive fills up too quickly. But for a pure business machine the size of the hard drive is sufficient. In addition you could always replace the hard drive with a larger one via the access panel on the underside of the notebook. 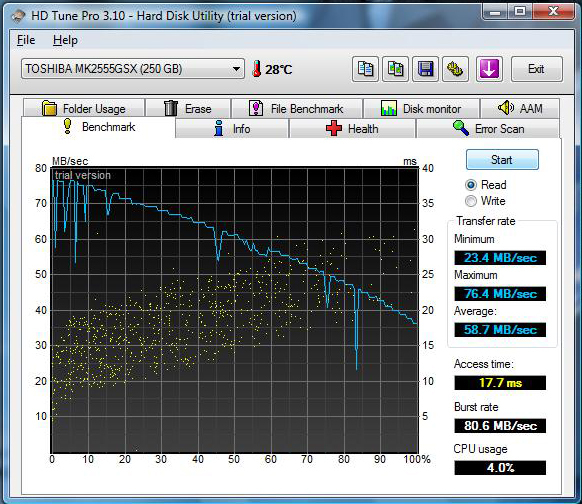 In the HDTune test the hard drive performed well, achieving a high score with an average transfer rate of 58.7 MB/s, and a satisfactory access time of 17.7 milliseconds. The DVD burner is a product of Sony subsidiary Optiarc: an AD-7590S which can read and burn DVDs at 8x speed. The drawer has to be manually closed when you put a DVD in it. Whilst doing this we got the impression that the drawer wouldn't fit properly into the body of the laptop; we had to push against some sort of resistance, as if the drawer had jammed. The effect seems to be intentional, since we can find absolutely no flaws in the workmanship of the drive, but it does feel rather strange and will take getting used to. The WLAN adapter is an Atheros AR928X, which supports the established 802.11 b and g standards as well as the new 802.11 n standard, which is supposed to give a better quality signal and faster transfer rates. 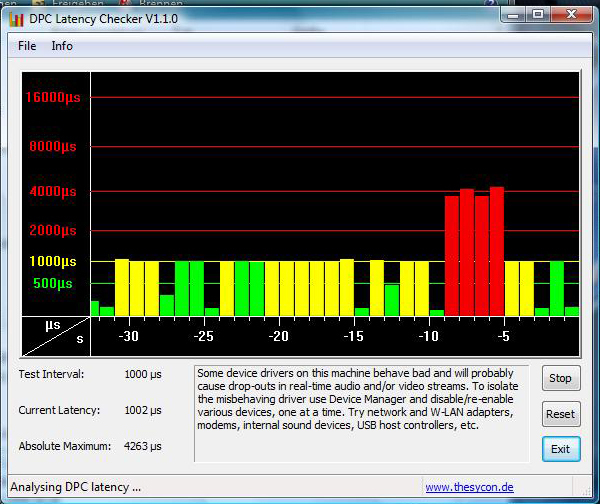 Finally, we used the DPCLatency program to test the latencies, which come into play when using connected external devices. If they are too high it can lead to interruptions in the data transfer, which can be very irritating if it causes problems with sound or video. 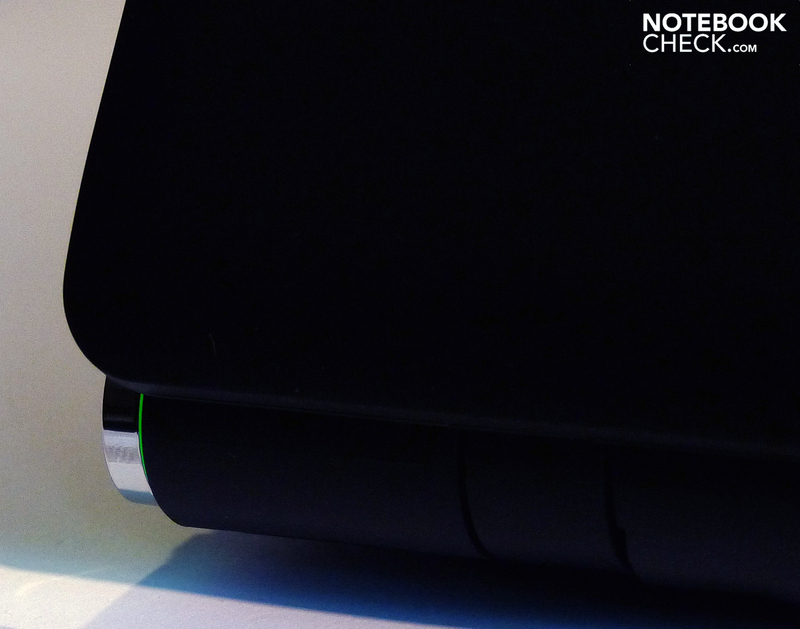 The BZ26M slipped up here in a couple of places, so before you buy, if at all possible, you should test whether the external devices you plan to use are going to get along with this notebook. 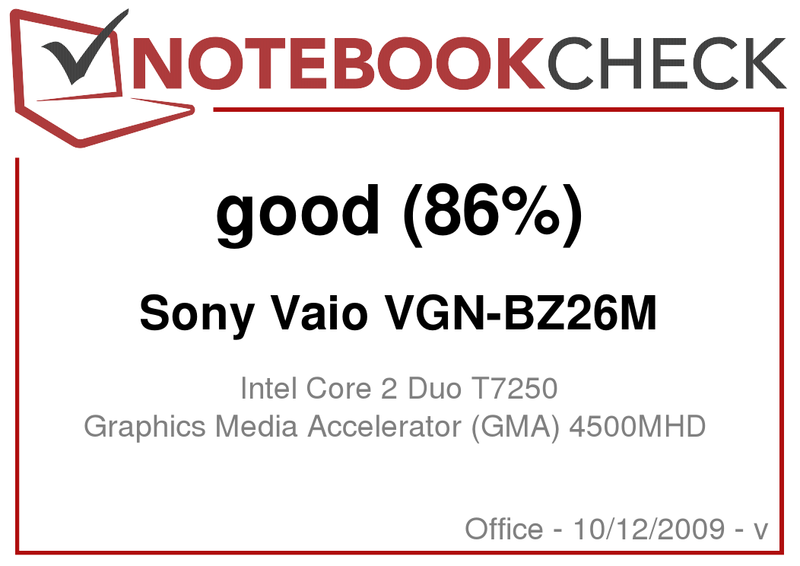 Although Sony has not used an especially energy-efficient processor in the Vaio BZ26M, the fan volume is quiet and at times barely perceptible. When the notebook is idle, the noise (or in this case the quietness) is the same for hours on end, with the fan purring gently along at 31.2 dB(A). You have to put your ear to the left side of the notebook to be able to hear it at all. If you go out of your way to subject the BZ26M to heavy use, you can raise the noise level of the fan to 40.3 dB(A). But this is still entirely bearable, and the BZ26M is designed for lighter office tasks which rarely require this level of processing power. 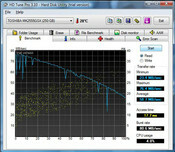 The hard drive is barely audible the whole time at 31.6 dB(A). The DVD drive makes a noise of 36.8 dB(A) during plackback which is a bit more substantial, but will not really impinge on your viewing pleasure. If you're looking for something to keep you warm during the winter months, the BZ26M is not for you, as the temperature build-up is impressively low. The underside of the casing heats up to 38.4 degrees C at most, in the area where the air vent (and therefore the processor) is found. In idle mode the heat build-up reaches a maximum of only 34.3 degrees, which is barely noticeable. So if you are hoping to work with the notebook on your lap sometimes, the prospects are good: under normal circumstances this notebook should not overheat. The power supply, on the other hand, can hit a maximum of 59.7 degrees and so could double as a hand-warmer. However this almost 60 degree figure is an extreme value which will rarely be reached during normal usage. With an average amount of activity the power supply remains cool. (-) The average temperature of the palmrest area of similar devices was 28.2 °C / 82.8 F (-3.6 °C / -6.4 F). Generally you would not expect much from an office laptop in terms of sound, but this Sony Vaio is actually very convincing. The speakers are built into the machine above the keyboard, under a perforated grill, and while they may not be close to the quality of, say, Altec Lansing or Harman Kardon speakers, they do produce a surprisingly full-bodied sound. Voices do come out sounding a little flat, but they are still clearly understandable. The volume is sufficiently loud and MP3 files also sound excellent. The 3.5mm headphone jack provides good quality sound. 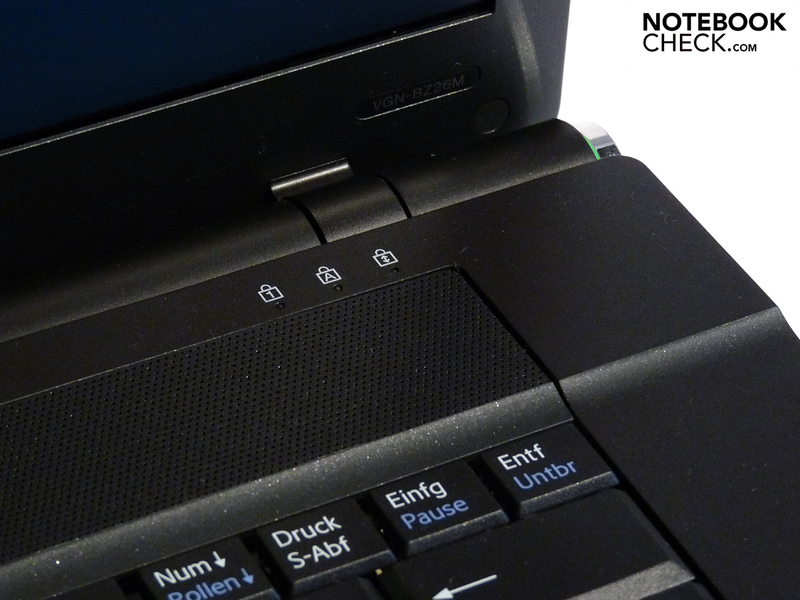 A button on the right above the keyboard switches off the notebook's sound completely, which could be very practical if you find yourself in an important meeting. Sony's engineers have built a six-cell battery with 55 Wh capacity. This gives the BZ26M a maximum battery life of 382 minutes, which is 6 hours and 22 minutes. To achieve this run time we had to turn on all energy-saving measures and let the Battery Eater tool read just a single text document (Readers Test). The minimum battery life, in contrast, was only 88 minutes (about an hour and a half), reached in the Battery Eater (Classic Test) which involves heavy use of the notebook with WLAN enabled, full screen brightness and optimum performance from the processor and graphics card. Since neither test is particularly close to reality, representing rather the two extremes of the battery, we also tested how long the battery would survive during internet surfing and DVD playback. Both values were similar: with wireless internet surfing we reached 3 hours and 40 minutes before the battery gave up, and 3 hours and 20 minutes with DVD playback, enough for the most epic of films. It is somewhat surprising that the notebook lasted for similar lengths of time during these two activities. Normally surfing takes up less battery power than watching a DVD. So the battery life is wholly adequate for light tasks, but if you overburden it you will find the battery drains reasonably quickly. Resource-intensive tasks should be carried out at home before you travel. Other than that, the BZ26M can work reliably and for a long time away from a power supply. 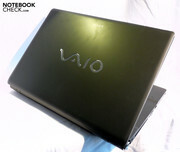 Many notebooks two or three times the cost of the Sony Vaio VGN-BZ26M do not offer such high quality workmanship. The magnesium case is definitely one of the highlights. And Sony has also succeeded stylistically; what is often over-done on consumer notebooks is here an understated but very attractive design, thanks to the matt surfaces and sleek black lines. 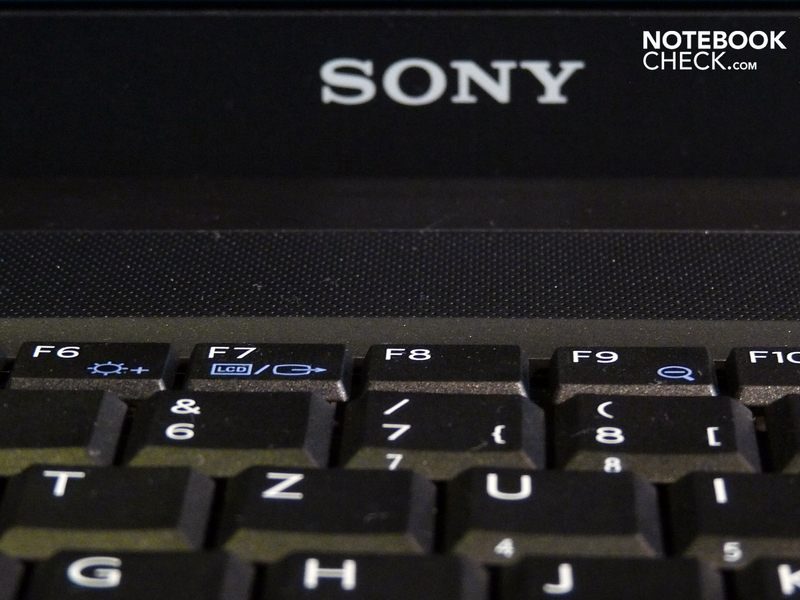 Anyone who values a good keyboard, a matt screen and an absence of distracting LEDs in their field of vision will not be disappointed by this business notebook from Sony. It also offers very decent speakers, well suited to watching DVDs or perhaps playing a few (old!) games; this is by no means a given for an office notebook. However you should not expect the earth from this laptop, strong as it may look. 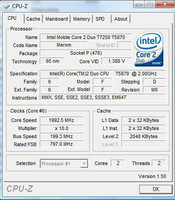 The processing performance is acceptable thanks to the dual-core processor, but no more than that. The hard drive is not overly large at 250 GB, and having only 2GB of memory adversely affects the performance. True business professionals will also feel the lack of a built-in webcam for video conferencing, as well as the fingerprint sensor which would have helped protect sensitive data. But if you are simply looking for a robust and yet very good looking machine to help you through your daily office work, surfing the net and occasionally watching a DVD, then theBZ26M could be the faithful companion for you. And when used on the go it can also last for a reasonably long time. Many thanks to Notebooksandmore.net who kindly lent us the model for testing. You can customize and buy the notebook here. The hinges are attached to the lid on the front side, which looks smart but stops you tilting the screen back more than 45 degrees. ... and red while idle. 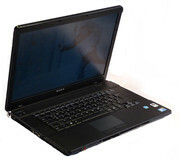 The BZ26M is equipped with 2 GHz Intel Core 2 Duo processor. Status LEDs for battery, hard drive activity and WLAN on the front edge of the machine. The screen is matt, producing barely any reflections even in strong light. Two access panels on the underside of the notebook allow you to change the hard drive and memory. You don't have to close the lid to change the battery, as it is inserted from underneath. Above the keyboard to the left is a WLAN button and a mute button. The loudspeakers, placed above the keyboard, are surprisingly good for an office notebook. The touchpad works well, except for the scroll function which is a little irritating. ... and a pleasant feel. 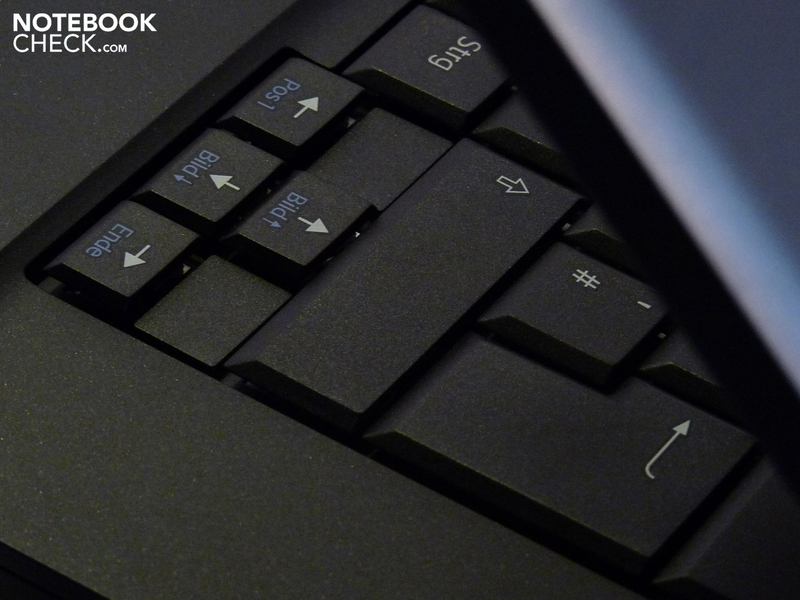 The comfortable keyboard, excellent touchpad and powder-coated surfaces are also pleasant to the touch. There are some nice extra details. One of Sony's latest design features: the keyboard section is set slightly lower. The keyboard is pleasant to use. It has large keys which respond firmly. Sony has gone for a conventional keyboard this time rather than a chiclet. Sadly there is no separate number pad. 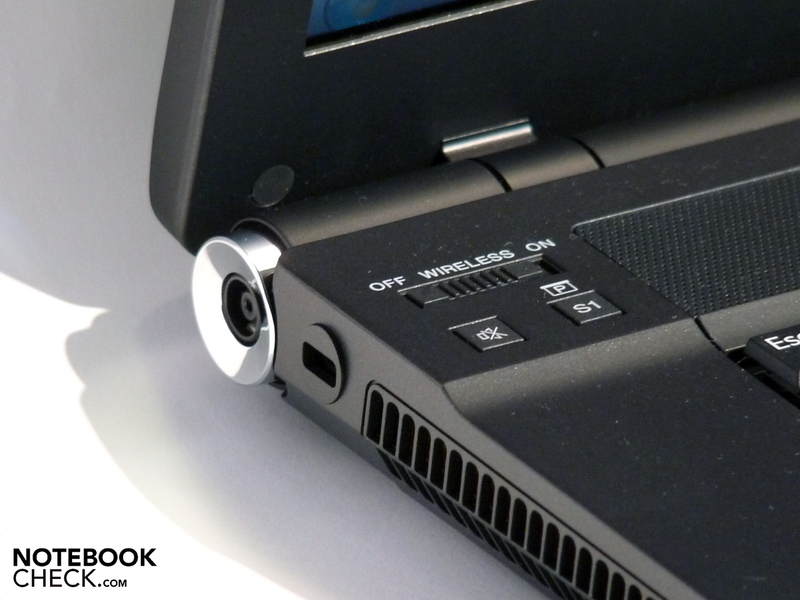 The port for hooking the laptop up to a docking station is also underneath. The unfussy but interesting design. A number pad would have been nice. That so many other business notebooks have a glossy screen, when the BZ26M demonstrates how much more practical and pleasant a matt screen is. The Samsung Q320 is a good office machine which also offers a dedicated graphics card. However it does have a glossy display and a significantly higher price tag. The Acer Travelmate 8571 is in the same price range as the Sony BZ26M, and comes with an energy-efficient processor and more hard drive space.